An FJ40 in your investment portfolio? You know the universe of classic four-wheel-drive vehicles has shifted when you watch a 1966 FJ40 Land Cruiser auctioned for $62,500 and think, Wow—bargain. Twenty years ago such a concept would have been absurdly impossible. Even ten years ago, with California-origin nut-and-bolt restorations beginning to sell for several times what any new Land Cruiser ever did, no one thought of FJ40s as investments. Has that changed? It’s difficult to say. Certainly there’s no doubt I could sell my FJ40—which is in excellent condition but hardly a concours piece—for six or seven times what I paid for it second hand in 1978 ($3,500 if you’re curious). And several recent over-$100,000 auction results for pristine and/or totally restored examples raised eyebrows among us long-time owners. No, actually those results triggered incredulous four-letter outbursts. But only time will tell if they were aberrations or indications. Tim Hüber and I saw the 1966 FJ40 in question at Gooding & Co. in Scottsdale this January. On a cursory inspection it appeared to have been sympathetically and authentically restored to original specs—with the jarring and unattractive exception of shiny fake-beadlock wheels, probably eight inches in width, which made the otherwise perfectly sized 33 x 9.50 BFG All-Terrains look weirdly puffed out. Grey steel factory 15s and hubcaps would have been inestimably superior. Still, wheels are easy to swap. And why “bargain?” The pre-sale estimate was $90,000 to $130,000—commensurate with those recent sales. However, to be fair, many other vehicles at the same auction failed to make their estimates. 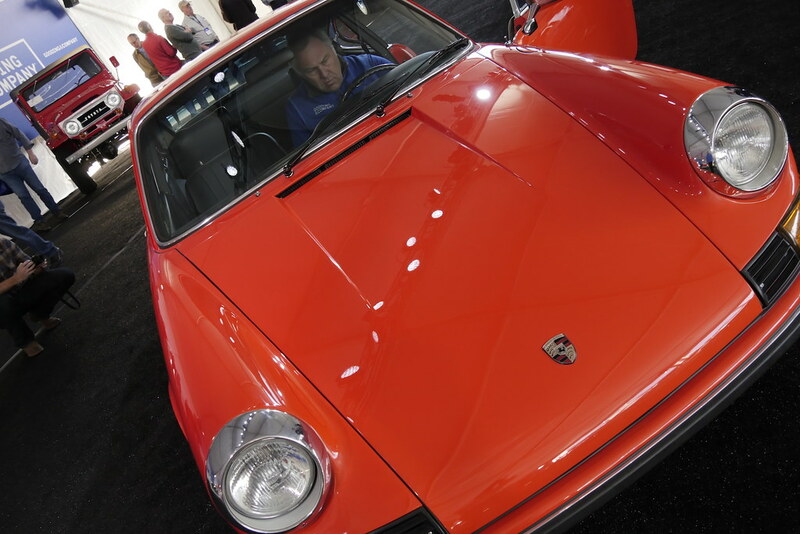 The 1973 Porsche 911T you see pictured here sold for $79,750 despite a pre-sale estimate of $90,000 to $110,000. So that in itself is not a sign that the FJ40 market has topped out. Note the similar pre-sale estimates. Interestingly, 20 years ago you could pick up tatty but driveable early 70s 911T (the base model 911 at the time) for around $6,000, probably about the same as a really nice early 70s FJ40. The difference is, today even a tatty early 70s 911T is worth upwards of $20,000, while driveable FJ40s can still be had for $4,000 to $5,000. That why I’m not yet ready to bet whether the elevated market for pristine examples is a trend or a bump. There are a lot of 40s still being used for deer hunting and hauling cement. It sure is fun to watch, though—and even if some of them remain garage queens for now, it’s nice to see FJ40s being preserved for the historical artifacts they are, as well as the superb working vehicles they can still be. Older PostCheck your pressure gauge!